Every youth worker needs to know how to play the guitar, right? OK, maybe that’s an exaggeration, but if you’ve wanted to learn and you have an iPad or iPhone here’s an app to help you teach your self. Check out iGuitarTeacher, and it’s FREE for a limited time. Lessons for all levels and styles… It doesn’t matter if you play an acoustic guitar, electric guitar or both. Our lessons are designed for both. Whether you are a complete beginner or if you have been playing for years and years, we have designed an app for you that will change the way you look at the guitar. 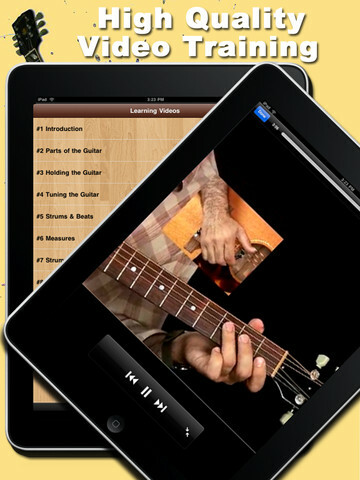 The following guitar lessons have been created with the beginner in mind. It is suggested that new guitarists begin at lesson one, spending at least one week learning the exercises and songs in that lesson before moving on. Learning to relax while playing guitar will help immeasurably, so be sure to have fun!